Have you ever roasted a chicken? It’s incredibly easy to do and the results are always amazing. If you’ve been intimidated by roasting a chicken, I want to encourage you to try it out. 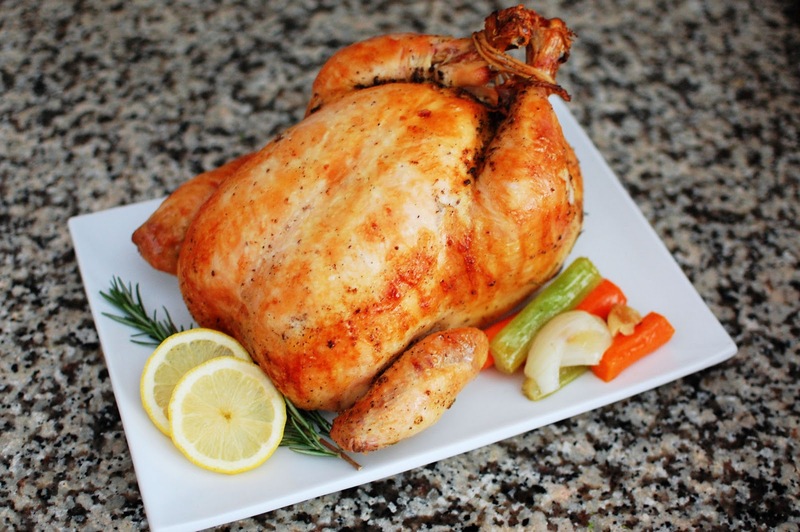 Whether you’re a chicken roasting veteran or not, I highly recommend this recipe. I’ve made it quite a few times and I just love the results every time. 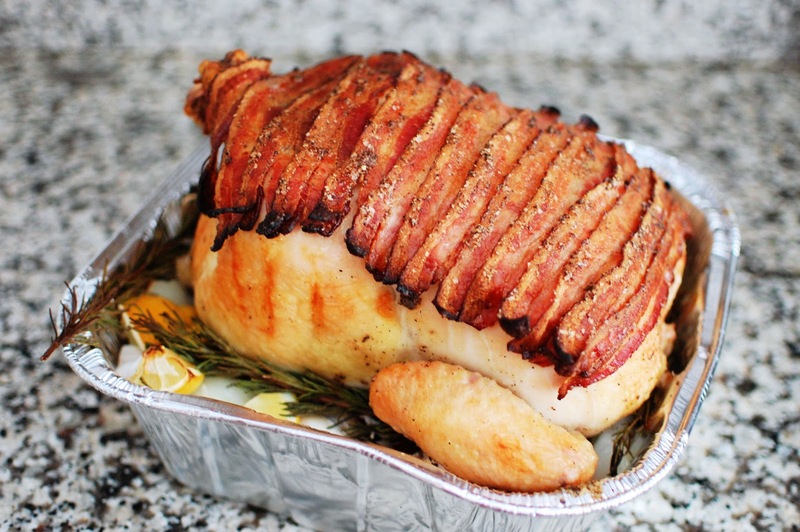 Of course, it doesn’t hurt that the chicken is roasted with bacon on top of it! The bacon helps impart a delicious flavor onto the skin of the chicken. 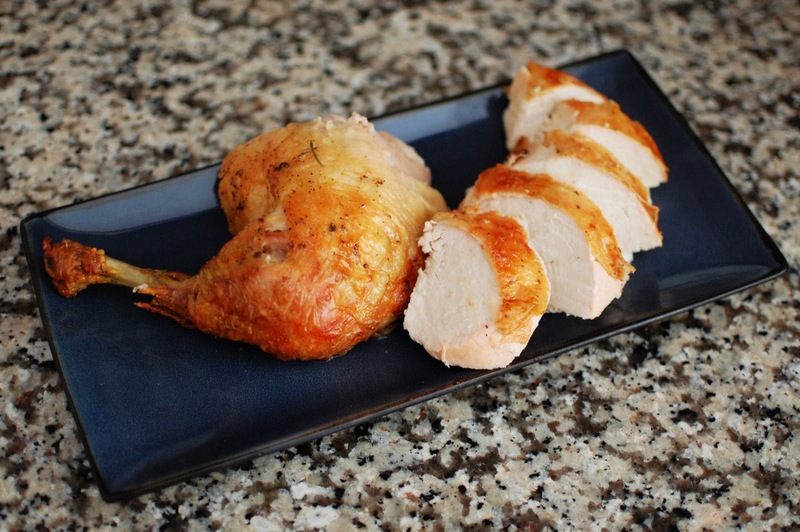 The lemon, garlic, and herbs stuffed into the chicken make the meat extremely flavorful. To top things off, the veggies that prop the chicken up make this a complete meal in one pan. 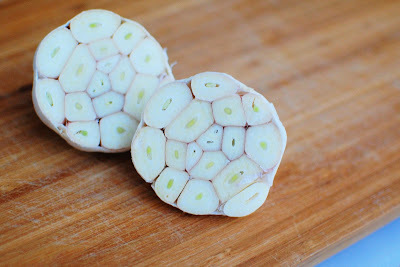 It also goes great with these potatoes (also from Ina Garten). The original recipe calls for making a gravy out of the drippings but Hubby and I always skip it. The chicken is so moist, it definitely does not need any gravy. Hubby and I love to make a roasted chicken on a Sunday and pick our way through it for lunches during the week. You can also throw it into a sandwich or a chicken salad. Place chopped onions, celery, carrots in the bottom of a large roasting pan. Remove the chicken giblets. Rinse the chicken inside and out. Remove any excess fat and leftover pinfeathers and pat the outside dry. Place the chicken in the roasting pan. Liberally salt and pepper the inside of the chicken. Stuff the cavity with the herbs, 1 lemon, halved, and 2 halves of the garlic. Brush the outside of the chicken with the butter and sprinkle again with salt and pepper. Tie the legs together with kitchen string and tuck the wing tips under the body of the chicken. Cut 2 of the lemons in quarters and scatter the quarters and remaining garlic around the chicken. Lay the bacon slices over the chicken to cover. Roast the chicken for 1 hour. Remove the bacon slices from the top of the chicken and set aside. Continue roasting the chicken for an additional 1/2 hour, or until the juices run clear when you cut between a leg and thigh. Slice the chicken on a platter. Garnish the chicken platter with the bacon slices, roasted veggies, roasted garlic, and 1 lemon, sliced. Serve with the gravy. This looks like a wonderful dish that’s colorful and healthy too! Yum! I really want to try this. I am definitely making this for my hubby – he adores red curry, and I adore my crock pot! It’s a match made in heaven! I’ve been looking for something to do with my leftover butternut squash but hadn’t found anything inspiring until now! I’m definitely sticking it in curry. Thanks!